As our young spring crops approach harvestable size this chilly spring, we find ourselves still relying on cold-hardy vegetables like Swiss chard to tide us over until abundance arrives. A member of the beet family (Beta vulgaris), chard is low in calories and loaded with antioxidants and vitamins. A 100-gram serving contains a third of the RDA of vitamin C plus vitamins A, K, beta carotene, and iron. 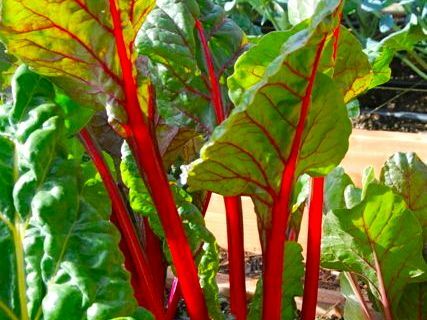 Chard is easy to grow in a home garden. We typically grow a variety like Bright Lights from Territorial Seed Company, which produces plants with rainbow-hued stems of white, yellow, pink, and red. Although we grow chard from plant starts from our friends at Gales Meadow Farm, it can also be planted from seed from April until mid-July. We plant it with 12-inch spacing and allow up to two weeks for germination. Chard will then mature in approximately 60 days. Once fully developed, the outer leaves can be harvested as needed. We carefully cut off up to 30 percent of the plant’s leaves at a time, which allows the plant to continue producing over a long season. Our summer-planted chard often overwinters. When damaged by extreme winter cold, the leaves can be cut back. Once warmer early spring weather arrives, we add compost, and the plants start growing again for a spring crop. Keep plants healthy and vigorous by growing in a spot with full sun, using compost and other organic fertilizers, and by watering consistently, preferably through drip irrigation on a timer. Healthy plants are much less susceptible to damage. This is one reason we grow chard from starts, encouraging strong, vigorous, mature plants as quickly as possible. Once plants are mature, they tend to be less vulnerable. Pick off and destroy infested leaves immediately. Do not compost them. The plant will continue growing new leaves which will hopefully not be affected. We’ve been told that Neem oil can be used, but we have not found it to be particularly effective, probably because the insects are inside the leaves and not really in contact with the oil. We’ve also heard that the parasitic wasp Diglyphus isaea is effective in killing the larvae, so that may be worth trying. 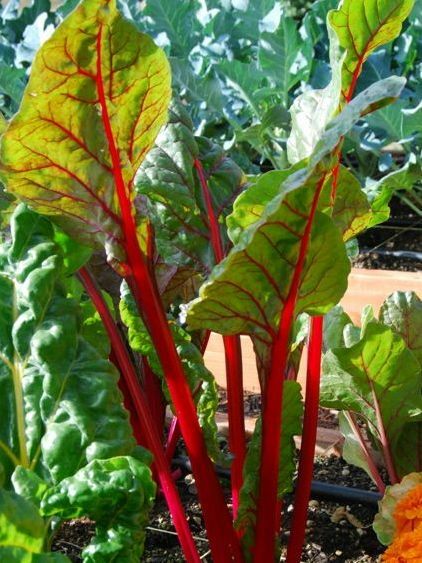 [%image chard float=right width=300 caption="Chard is easy to grow in the home garden."] Rotate crops from season to season, as the flies have several life cycles during a season and can even overwinter in the ground under the host plants. In a garden with leaf miners present, we usually pull out the plants rather than overwintering them for this reason. Tear off, throw out, and do not eat the damaged parts of chard leaves, although the undamaged parts of leaves are fine to use. Chard can be substituted for spinach in soups, sautés, risotto, and other dishes. We add chopped and blanched chard to dishes like lasagna or macaroni and cheese to offset the richness just a bit and, of course, to up the nutritional value. Many people use just the leaves, not realizing that the stalks are delicious and very easy to cook. Try, for example, this recipe for an Olive Tart with Chard from the Robert Reynolds Chefs Studio, which utilizes the leaves in a savory tart accompanied by the stalks as a pretty side salad. Another favorite of mine is Marcella Hazan’s Swiss Chard Stalks Gratinéed with Parmesan Cheese, an easy side dish that makes a nice accompaniment to roast chicken or other simple main courses.